Doug Fishbone’s Leisure Land Golf is a fully playable crazy golf course, with each golf hole designed and made by a different artist from the contemporary art world. Each artist differs greatly in style, medium, influence and background, resulting in a series of very different artworks which all share the same concept – the ‘Leisure Principal’. The ‘Leisure Principle’ is the curatorial theme that has inspired the content of the installation. It refers to the idea of tourism and trade as a metaphor to explore current global economic debates through one of the key values of leisure – consumption, and how it shapes our identity. 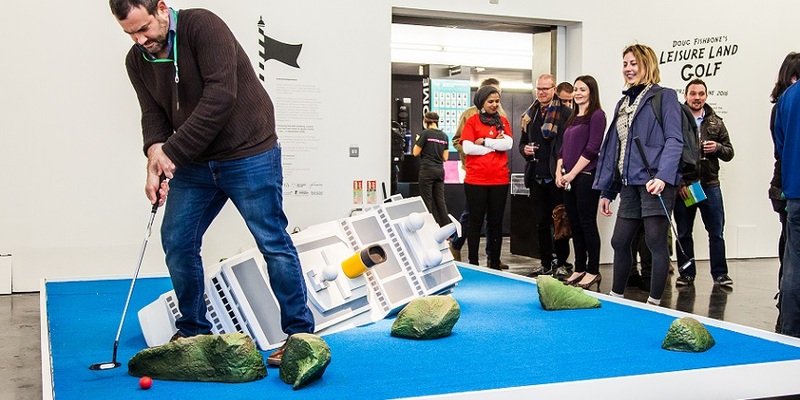 Beyond the sculptural brilliance of the works, interacting with the pieces themselves through playing a round of crazy golf invites visitors to engage with important cultural topics including migration, global warming and globalisation. More widely, the artworks ask us to explore the histories and relationships – both real and imagined – between work, leisure, colonialism, tourism, information and economics. While golf is a recognised sport, normally associated with the wealthy elite, crazy golf is often considered a working-class activity played purely for fun – again widening the debate surrounding consumerism and leisure across different socio-economic levels. Alongside our more traditional collections, York Art Gallery endeavours to bring a variety of artworks to the gallery including contemporary pieces by cutting-edge artists. Working with Art Fund, we launched an Art Happens campaign to raise the £10,000 needed to bring this incredible installation to our Artists Garden space. Thanks to the generous donations of our supporters, York Art Gallery successfully reached the target. Leisure Land Golf was open to the public 3 June to 3 September 2017 in our Artists Garden. Created during the Gallery’s recent refurbishment, the Artists Garden is a free public space used to display a changing series of art installations, offering a place of reflection and inspiration in the heart of York’s city centre. Doug Fishbone’s Leisure Land Golf is a touring exhibition by New Art Exchange (NAE), Nottingham. The Exhibition was originally commissioned by EM15, a collective of arts organisations from the East Midlands, for the #56 Venice Biennale. Image: Doug Fishbone, SOS, 2015, photo credit Bartosz Kali.